“When I first sketched out this idea, I never imagined what a happy surprise it would be,” says San Francisco cookbook author Michelle McKenzie. “I couldn’t predict how perfectly nutty black rice would complement asparagus, or how spicy mizuna would play so nicely with sweet mint. Or that green onion could add just enough punch. I guessed, but didn’t fully believe, that a tahini and fish sauce dressing would pull everything together.” But all of that happens here. Bring a medium pot of water to a boil; add salt until it tastes like the sea. Add black rice and simmer until almost but not quite tender, 5 to 6 minutes (it will continue cooking as it cools). Drain, then immediately spread out on a rimmed baking sheet to cool it quickly. Meanwhile, bring another medium pot of water to a boil and add salt as above. Fill a large bowl with ice water and place near the stove. Slice asparagus into 3- to 4-in. lengths, then thinly slice lengthwise. Cook asparagus until crisp-tender, 30 seconds, and immediately transfer to ice bath. Slice green onions into 3-in. lengths, then thinly slice lengthwise. Add to bowl of asparagus, with more ice if needed. Let sit until green onions crisp and curl, about 6 minutes. Drain vegetables well, spread on a kitchen towel, and pat dry. Heat a medium (not nonstick) frying pan over medium heat. Add sesame seeds and toast until just fragrant, about 3 minutes, shaking pan every now and then. Pour onto a plate to cool. In a large bowl, whisk fish sauce with lemon zest and juice, honey, tahini, olive oil, and 2 tsp. warm water. Season to taste with fine salt. Add cooled black rice, asparagus, green onion, threefourths of mizuna, and half of the mint, toasted sesame seeds, and chile flakes. Add two large pinches of fine salt and toss gently to combine. Pull out several asparagus spears and set aside for topping if you like. 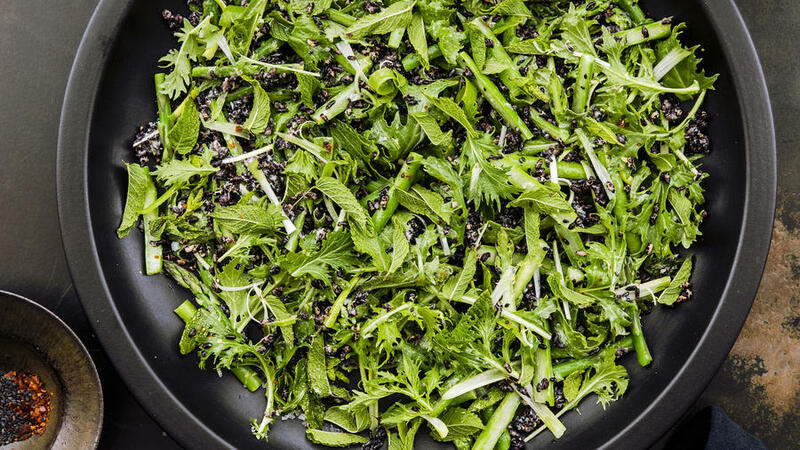 Spread salad on 2 large serving platters and top with remaining mizuna, mint, sesame seeds, and chile flakes, plus a sprinkle of flaky sea salt and the puffed black rice (if using). *Tart, fruity Aleppo chile is available from Oaktown Spice Shop in Oakland, CA (oaktownspiceshop.com; $7.50 for a 1/2-cup jar). MAKE AHEAD: Black rice, up to 2 days, covered and chilled. Blanched and dried asparagus and crisped green onion, up to 2 hours, chilled.